2 Bags Full - My adventures in travel, knitting, and the blessings of my every day life. : A Bountiful Harvest-- the Harvest nests are here! A Bountiful Harvest-- the Harvest nests are here! After a year of designing and long hours of creating -- I am thrilled to finally see this dream come to reality. The Harvest Nests are finished!! This special season is one of my favorites~ it is a feast for the senses as well as a state of mind. To me, Autumn signals the turning of the year~~ a time to take stock of all that you have accomplished throughout the past months ~ a time to appreciate your bountiful blessings. Autumn is a splendid and colorful gateway to the winter season. This nest is truly a celebration of bounty-- in my heart it represents the outpouring of love and support that you have all given to me and my "little nests." The creation of 45 Designer nests has been "all consuming" (translation --- LOTS of long, and late nights)-- but now that they are completed -- I have such a sense of satisfaction, knowing that we (Mary and I) have been able to create these for all of you. To those of you who have waited so long -- almost a year for these nests to come to life --- my heartfelt thanks for trusting me and allowing me to do this for all of you. Those of you who have been on the waiting list will find your nests now listed in my ETSY shop. Please go to the Reserved Section of the shop that corresponds with the first letter of your LAST name. as vibrant as the leaves on the Autumn trees. Nestled inside each nest are 3 exquisite beaded acorns. Can you see the little tin heart? Each nest contains a little heart -- a little "love"
from me-- to all of you. made by my friend Sue. to being small, limited quantities. My friend Jan heads up a little knitting group at her church. 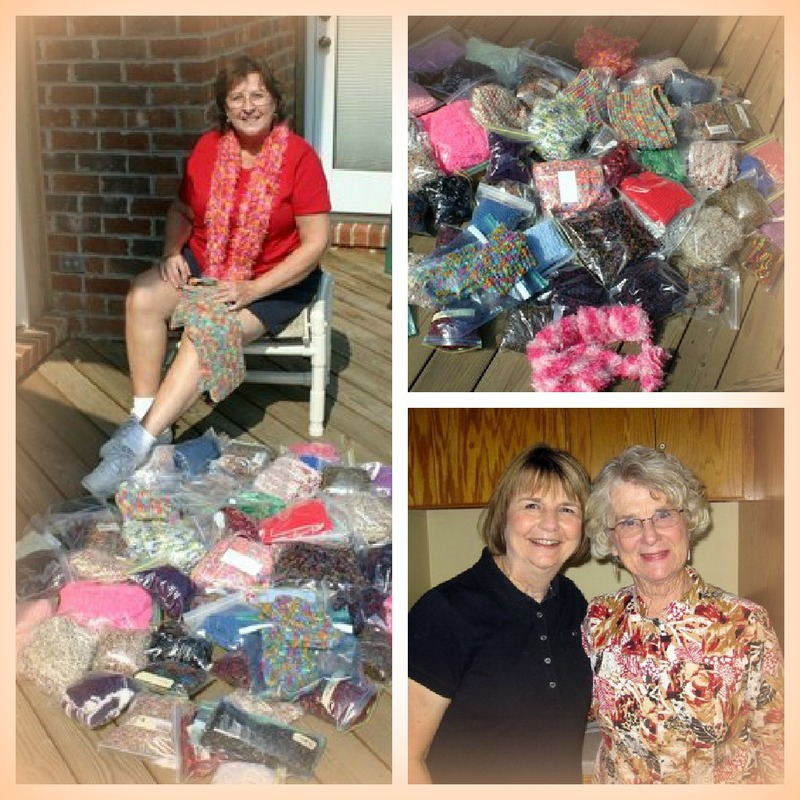 She and members of her group lovingly knit scarves throughout the year. In December - the month of true giving-- the scarves are donated to several local charities who provide services to the needy and homeless within our communities. Most of the yarns used by the ladies in her group are donated by people of the church. Take a good look!! Because this is something that you aren't likely to ever see again ---45 nests!! (It took us forever to carry all of these outside -- sit up for the photo -- and then carry them (ever so gently!!) back inside again!! That's Mary sitting up front -- looking beautiful in her turquoise. I'm the one looking like the "great pumpkin" sitting in the back. So--- what's up next? Those of you who have an interest in joining the waiting list for the Woodland or Shabby Chic nests (as pictured on my sidebar) still have time. There are a few more places open -- but I am going to have to close those lists very soon. I will be making those nests this winter and they will be making their way to folks in the spring. They are absolutely beautiful. You take a nice long well deserved rest. See you in Oct. Your creations and your generosity make MY heart sing! Absolutely beautiful photographs and you and Mary look fabulous as well. Vicki, I am thrilled that I will have this nest to showcase in my home for the arrival of Autumn ~ my favorite season. It is STUNNING!!! And blessings to you, Vicki, for the time and love you put into these nests for charity. I'm not sure how I missed the Shorebird Nest, Vicki. It is precious. If you ever make another Shorebird Nest, please add me to your list right from the start! OH MY WORD!! (as my mother used to say)..these nests are breathtaking. I can see why you will limit your quantity.. I can't begin to imagine ALL the work you put into this project. But for those of us who will be receiving one in the mail...totally appreciate all that time and effort. I just keep saying (alas to myself) OH MY OH MY. Thanks to for letting us know where your donation will go. A worthy cause for sure. Thank you.. thank you.. thank you. The pictures are fantastic. You so do NOT look like a pumpkin!!!! I don't blame you for taking a break...enjoy! Me again.. I just ordered my nest. I'll be on pins and needles till it arrives. My goodness, those nests are stunning! Incredible variety of yarns, fabulous bits and pieces, bling, these nests have it all. They truly are a celebration of Fall and harvest time and the incredibly bountyful gifts of Mother Nature. Incredible, such an immense project to create 45 of these little beauties. They look incredible in the garden together. Oh what beautiful nests, so colourful and reminiscent of a woodland walk. They are wonderful creations and it's lovely you are donating your profits to a charity showing the true spirit of the blessings of harvest time. Oh goodness - the new nests are stunning- so colorful and filled with love and little special pieces and Fall wonders. You and your friend who made the adorable tags are so gifted. God bless you for donating the proceeds to the knitting group. Have a wonderful blog break. P.S. The tags are beautiful, too! Your nests are incredible!!! Can't wait to get mine. Vicki, they are breath taking; well done! Enjoy your well deserved break. You out did yourself with the beautiful harvest nests. The photos of them all together are stunning. I adore the mix of beads and variegated yarns. soooooo pretty! Ohh my goodness Vicki! You constantly amaze me with your talent and your work!! These nests are beautiful and each one so lovely blended with the colors of the upcoming season of fall! Vickie, no wonder you need a blog break-45 custom nests is an incredible fete!! They are all so gorgeous! I'm sure you have made 45 people exceptionally happy!!! See you when you get back! Your harvest nests are beautiful!!!! I love all the fall colors you used and those little acorns are just the sweetest little things ever. Those 45 people will be thrilled to receive their beautiful nest! The photo shoot is amazing seeing all those nests in one spot! Vicki, you must DREAM beautiful yarn dreams! :) Everything is gorgeous! My nest arrived!!! It is beyond beautiful! The colors are amazing and every little item you've incorporated into it makes it a very special Harvest Nest. Thank you for making these works of art for our homes. So very beautiful and full of detail!! Ciao Vicki! Your nests are so beautiful! Vicki, These nests are beyond words exquisite!!! The colors, the fibers, all of the goodies woven into them...just everything! All of the love and time you put into each nest definitely shows. They are such treasures...and you my sweet friend, are an absolute angel! You have excelled yourself this time, dear girl, the Harvest nests are stunning! I just know that all those who ordered one from you are going to be as delighted with their nests as I am with both my Woodland and Christmas nests. Have a wonderful break, sweetie, you really deserve some R&R after this mammoth task. Please be aware there is a very special knitter living in Kentucky that is claiming to be you. She has a heart of gold and a special talent for knitting up the prettiest nests I have ever seen. What lovely lovely things you create, Vicki! I think I visited you way back during OWOH event, but I'm afraid I didn't keep up with following you. Thanks to Sandra, I have found your blog again and would love to join in with your Grow Your Blog event. Enjoy your rest through September. Oh soooooooooooo pretty! WOW 45 nests I can't imagine. I have one of your beauties. A gift from a friend for my BDay. Mine is one of the shore/beach themed ones. I just remodeled my Master Bath & she's back on the shelf above my tub. The eggs are still in the bottom of the nest but, I have a beautiful 1950's mermaids (like people put in the aquarium) in it. I'll be doing a post about the remodel soon so hope you stop by from time to time to see. SO FUN! Have a great week. When I returned home to California dear Vicki, I unwrapped my nest (and the gift card that came with it), and put them on my big work table. Just love them so much. I adore the photo of you with 45 NESTS. That is utterly amazing. They're in some of my favorite colors too. You constantly bring pleasure to all of us...pleasure AND beauty, and a zest for life. Sending love across the miles...and when I am in Lexington or that area, will you be around? I will be on book tour for a month. .... these are simply gorgeous! I am so excited waiting for my nest to come...... I hope it will be soon! Have a great Sunday. I am a texture freak and I love everything you do! Well done! Exquisite work! These are beautiful Vicki! Most definitely a bountiful harvest. thanks so much for getting back to me. I will be sure to continue to check you blog not only for the blog party but to see your beautiful creations. i think magic bird would live in these autumn nests. the nests look like they would have fell from the fairyland tree! magical!!! These turned out beautifully Vicki! And I LOVE the pic of you with all your nests! I hope someone is taking a picture of you as you knit...it's part of your story and it should be captured. Love the breast cancer nests too! Such a great idea. You have been a very busy woman~it's beautiful to see.